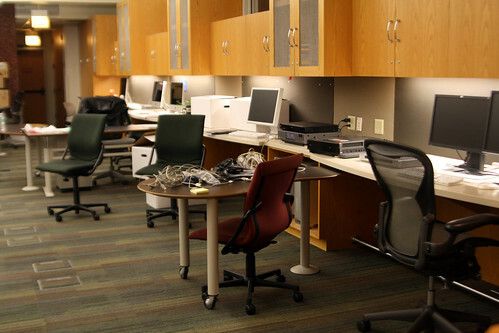 Here are some our most popular articles about ergonomics. There is a link at the bottom of each section for you if you would like more information. There's a big hype about ergonomics these days. You read about ergonomics articles in the magazines and hear about it on TV. So why is it so important? Ergonomics is important because it helps you avoid workplace injuries and take care of your health in a better way while working - either at home or in office. The most important part of our work environment ergonomics is the right posture. If you don't have a good ergonomic posture while working, your neck, back, hands, fingers, eyes and legs all will feel stress. A continued stress for a long time can result in severe strain and injury to these and other body parts. So you need to adjust your workstation right to avoid such strains. The height or your desk and your monitor, the distance of your monitors from your face, the angle of your eyes while looking at the screen, the position of your hands and feet, all are extremely important for your good health. So take some time to read more about it and make the adjustments so you can avoid the injuries due to improper posture. Working on computers seems to be a comfort of the modern day working environment. However, there is a huge risk of injury associated with it if we don't take proper ergonomic precautions. Our workstations - both at office and at home, should meet certain ergonomic standards. You should make sure that there is just the right kind of lighting while you work on your computer. There should be enough illumination and no glare either on the screen or around it. This would reduce the strain on your eyes even if you work for longer hours. Your chair should be comfortable and adjustable so your body doesn't feel any strain during the work. The seat should be comfortable and wide enough. The seat edge should not be sharp. The armrests should support your arms well and should not hinder your movements. You thighs, legs and feet should have sufficient clearance space so they don't feel trapped. Your monitor should at your eye level. You should be able to read the screen without bending your head down. Bending your neck down would put strain on your neck and your back. The monitor should be far from your face but you should be able to read it comfortably without leaning forward. There should be no glare at the screen from around the room, i.e. from the room lights or from the windows or doors. Your desk should be large enough to house your keyboard and mouse without you stretching for these devices. Your hands and wrists should not feel any strain while you work on the keyboard. 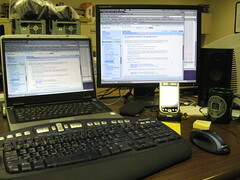 Read more about Computer Ergonomics. If you use a laptop, it calls for most of the same ergonomic principles to be applied. You should pay proper attention to the visibility, your posture, your monitor, your keyboard, mouse or touchpad, etc. Most of us use laptops for less than two hours a day. So the health risks while working on laptops for a short time are minimal. However the ergonomic principles apply to working on laptops as well. If you take care of the ergonomics, you will be doing good to your own health. However, if you use your laptop for more than two hours each day, it becomes increasingly import that you take the same ergonomic precautions that are described above for desktop computers so you can avoid and risk to your health. You should keep in mind your posture, and the angle of your eyes, your hands, wrists, etc. while typing. Read more in Laptop Ergonomics. If you don't take proper ergonomic care of your body while working at your computer, you could risk the following kind of injuries. This is a condition which results from putting repeated stress or strain on the body muscles. Body muscles stretched too much or for too long a time, will feel severe strain. Repetition of any strain on the body muscles causes the MSD. Most commonly affected body parts are the back, the neck, shoulders, arms and legs etc. Repetitive strain on your wrists and fingers wile typing for longer hours can result in carpal tunnel syndrome. The delicate tendons in your wrists and forearms feel too much strain from such typing work and can result in this discomfort. Back pain is a common complaint of people working on their computers for long hours. It is directly related to the posture you have while working. Paying attention to the ergonomic principles for working on computers can reduce the strain your back, neck and shoulder go through and can avoid you severe health problems. Read more about musculoskeletal disorders. Thank you for reading 'Ergonomics Articles'!